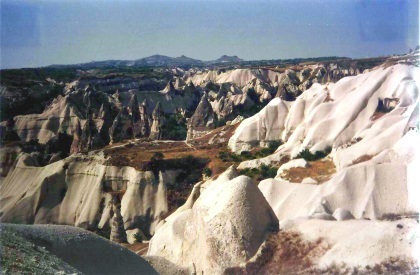 Göreme National Park and the Rock Sites of Cappadocia consists of an eroded landscape dotted with rock-hewn sanctuaries. It lies in the mid-western part of Turkey. The inhabitants of the area hew rooms, chapels, even whole villages out of the rocks. Religious Byzantine paintings can be found on the walls of the churches and monasteries. Coming from Eastern Turkey, Cappadocia is like arriving back in the western world. It is probably close enough to the coast to attract a lot of tourists. Despite this, Cappadocia is a beautiful place. Stay a few days, walk around and discover! Göreme National Park and the Rock Sites of Cappadocia are a geologic wonderland, steeped in the history of the early Christian church. I visited Göreme National Park and the Derinkuyu underground city in the fall of 2007 as part of a two day tour of Cappadocia, in central Turkey. 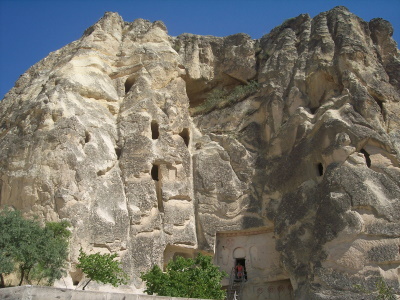 The town of Göreme, with its many cave hotels built into rock formations, is an excellent introduction to the region. All around the town are photogenic hoodoos, also called fairy chimneys. 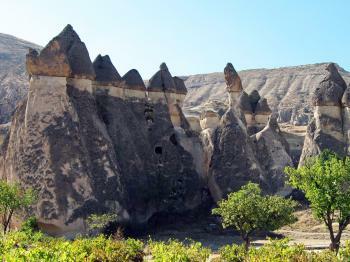 In the days of the early church, Christians found the soft rock of these wind-carved formations could be easily chipped away to create homes and churches. Today, some of their art can still be found inside the rock sanctuaries, though the faces of many of the saints have been scratched away. When the Arab-Byzantine wars began in the 8th century, the early Christian church in Cappadocia prepared to go underground, creating subterranean complexes such as the city of Derinkuyu, which was outfitted with stables, storage rooms, living spaces, and chapels. This was quite an amazing site to see. I hope that despite how long it has been since the last review, Göreme is still getting many visitors; it truly is a memorable landscape. Logistics: Göreme and its national park may be reached by bus from most major cities in Turkey; the nearby city of Kayseri, east of Göreme, may also be reached by plane or train. Although there is much to see within walking distance of Göreme, private transportation makes it easier to access sites further outside the park. visited in 2000 Went via bus from Egirdir. 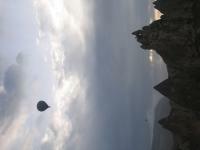 Cappadocia is about a five hour bus ride from the capital city of Ankara, where I currently live. Having been there a few times, I have to say that it is unique in the world, let alone in Turkey. The churches are great, but there is much more in the region than that. Underground cities, rustic village life, and a fantastic geological history make this place a must see. My personal favorite is just walking around Zelve. Enjoy! the cave churches in Goreme are fantastic. i visited in July 04. it's not too hot in this part of Turkey in summer. the Turks are the kindest people i've met in the world and you will feel safe and welcome wherever you travel. the WHS takes about 1/2 to do justice to. try to drive there. walking from town is a trek. it only costs about $5 to see it all. while the site has sidewalks near the rock churches, you need to climb up lots of stairs and crawl into places to really see it fully. Goreme town itself is an amazing site itself. try to stay in one of the "fairy chinney" hotels in town-- like nothing else. Also, spring for a balloon ride to see the whole valley of wonders. It is an unbeliviable site to visit and live! 4.5: Jay T Alias65 Coppi RobRos Tony H.
Europa Nostra Award: Conservation of Sarica Church. (Prize 2006 for Conservation). It isn't immediately clear that this church is within the originally inscribed boundaries but the UNESCO Web site states "The award for Conservation of Architectural Heritage has been given to Sarica Church in Cappadocia (Turkey), part of the Göreme National Park and the Rock Sites of Cappadocia World Heritage site." (from http://whc.unesco.org/en/news/345 ).